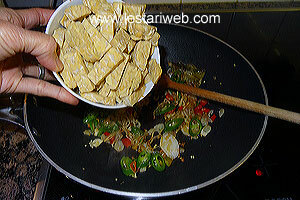 This is a typical daily menu along the rural villages & suburb areas of Java Island. I remember my mother cooked it often during my childhood time. 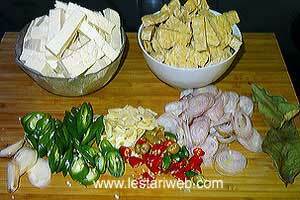 No wonder....the ingredients are available anytime & the cooking process is simply quick. 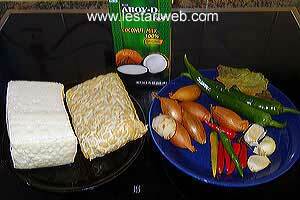 What you have to do just cut or slice the ingredients & seasoning spices, get the coconut milk & the dish is ready to serve in a swift time! And it tastes simply delicious!! 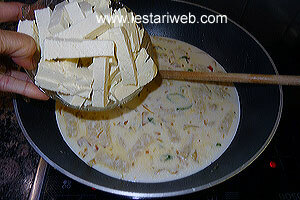 This is also a good alternative recipe for Vegetarian .. 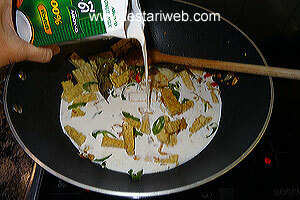 Tips: The seasoning spices should be stir-fried until well cooked before adding the coconut milk. This is the secret to obtain the best taste. If you dont mind the smell of petai or stinky beans, then try to get them on the recipe. 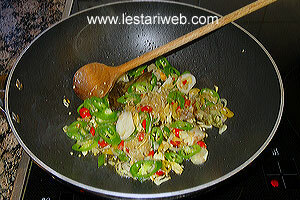 I assure you, Petai gives an exotic flavour to the sauce!! hmmmm......Yummy!! ;-) Unfortunatelly I din't have stock when I was happened to pepare this recipe, so this time the stinky beans was absent. But it still taste good though ;-). Alle Zutaten & Gewürze vorbereiten : waschen, putzen & schneiden. Beiseite stellen. 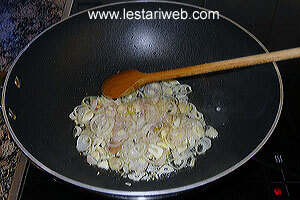 5 EL Öl in einem Wok oder einer Bratpfane erhitzen, Schalotten & Knoblauch braten & ümruhren bis sie duftet & transparenz geworden sind. 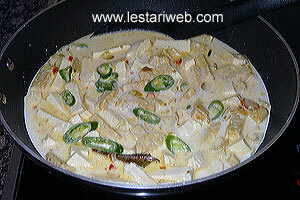 Chilis, Galangal & Salam/Lorbeerblätter hinzufügen. Zwischen der mittlere und starke Hitze braten & ümruhren bis die Chilis verwelkt sind. (Salz sofort hinzufügen, wenn sie wegen dem Chili-Rauch plötzlich & unkontrolliert husten ;-). Petaibohnen (wenn vorhanden) & tempe hineingeben. Ca. 5 Minuten umrühren bis die Petaibohnen verwelkt sind oder bis die farbe der Tempe sich verändert. Kokosnusmilch geben und danach Tofu hinzufügen. Bei mittlerer Hitze zum Kochen bringin. Gelegentlich umrühren. Mit dem Salz & Zucker abschmecken. ** Wenn Sie gemischte Kokosmilch (Wasser & dicke Kokosmilch) verwenden, geben Sie erst heißes Wasser in die Pfanne/Wok, danach dicke Kokosmilch hinzufügen & sofort umrühren.